Flat solar collectors Atmosfera is the ideal solution for the replacement of seasonal load in the heat, perfectly suited for warm and temperate climate. Besides the cost of the flat collector more attractive compared to vacuum. In the line of flat-plate collectors Atmosfera presents two models that are fully consistent with the ideology of the company: optimum ratio “price-quality-productivity”. 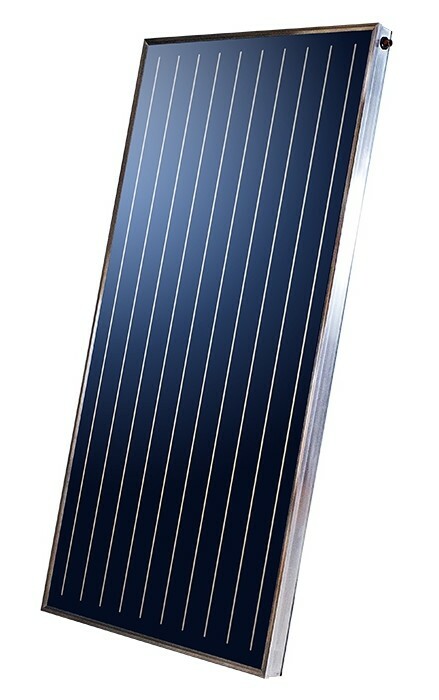 Flat collector SPK-F2M (production of Poland) has a high conversion efficiency of solar radiation energy into thermal energy due to copper absorber 0.3 mm thick, coated with highly selective German coating BlueTec Eta Plus. Copper coil heat exchanger in the form of the harp is connected to the absorber by ultrasonic welding, which ensures a high heat transfer from the absorber to the coolant. Patented manifold body made of special aluminum profile. To increase the bandwidth of the solar radiation collector is coated with a special 4 mm prismatic glass with low iron content. 4 cm mineral wool to minimize thermal losses of the collector, providing the conductivity to the environment at the level of 0.035 W/m K.
Flat collector SPK-F4M (production of Poland) has a copper heat exchanger in the form of a meander and an aluminum absorber coated with a selective coating of BlueTec (Germany), which allows to achieve high efficiency solar energy conversion. The absorber plate is to be secured to the heat exchanger by means of ultrasonic welding. The manifold housing-patent protection and are made of special aluminum profile. The collector is covered with special glass with low iron content to increase the throughput of solar radiation. 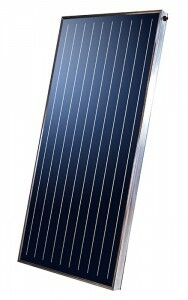 ATMOSFERA F4M comply with DIN EN 12975-2: 2006 have the test certificate of Solar Keymark. The manifold has 4 outlets, 2 on each side, allowing you to match them with a solar drain-back.